Bangalore: Will commuters see relief next year? Barely few months after the flyover was inaugurated, a board reading ‘work in progress’ welcomed motorists. BENGALURU: Commuters on the Nayandahalli-Silkboard stretch might breathe a sigh of relief by next year end, as work on all the under construction flyovers and underpasses is likely to be completed, hinted a BBMP official. While Rs 153 crore has been sanctioned towards road infrastructure to complete the flyovers and underpasses in this area, one specific stretch towards PES College, in Banshankri 3rd stage, has undergone several changes in past three years, and with significant delays. The stretch between PES College and Katriguppe, near Vidyanagar, was raised, and a flyover was erected. Barely few months after the flyover was inaugurated, a board reading ‘work in progress’ welcomed motorists. While the intention of this one-way flyover was to ease traffic coming in from Nayandahalli, for the last two years, the stretch has been choked. The state government had passed tenders for the rejuvenation of this 12 km stretch — which includes two to three flyovers and repair and construction of new underpasses from Nayandahalli to Silk Board, said Hosekerehalli corporator, Rajeshwarai Cholraj. This flyover towards PES College took over a year to be constructed. The inauguration of the same was delayed by a month, and was finally opened to commuters last year in December. However, the plan for laying an underpass a kilometre ahead of the flyover, was only initiated after three-four months. Last year, the road right after the flyover was dug up on both sides. 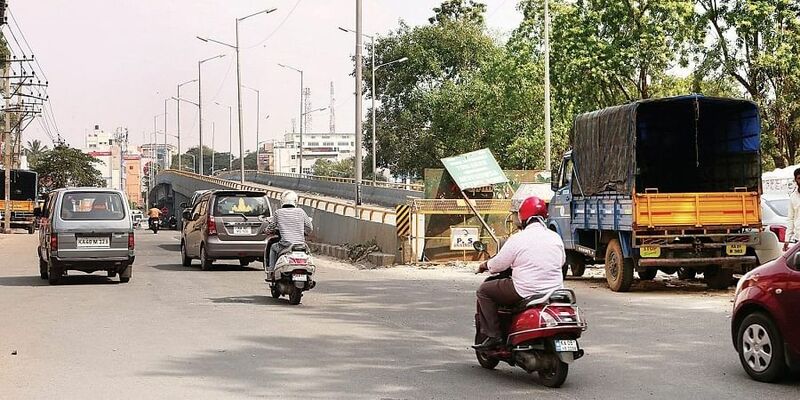 While commuters faced problems here on a daily basis, the BWSSB awaited for funds to arrive so they could shift the lines and construction of the underpass could be started, informed a source. Last year, in August, the flyover near PES was under construction, and this year, it remains closed again. Commuters are still travelling on damaged roads near the Vidyanagar petrol bunk. Moreover, they are now forced to take inner streets so they can connect to the main Nayandahalli-Silk Board stretch from the Devegowda petrol bunk. The flyover was under construction for over a year, and was inaugurated in December 2017. By July this year, it was closed again. Rs 18 crore was sanctioned for two underpasses near PES College, and `17 crore was sanctioned for construction of a flyover, which is now closed, Rajeshwarai Cholraj, corporator, Hosekerehalli, told CE.